To be published on September 17th. You can pre-order it now with the liniks above. In my art school days, I was drawn to the Persian minatures and indian court art of the Mughal dynasy at Boston's Museum of Fine Arts. The exquisitely jeweled royals and inquisitive explorations of birds, beasts, and flowers drew me into their world. Then I came across the Persian tale about the Abu Kassem's slippers cut into a wonderful novel, a story within a story. Fascinated by the timeless wisdon in the tale, how things in ojur past inform our present and future. I was inspired to retell the story and set it in the kaleidoscopic world of the Mughal courts. The Bengal tiger was my choice for this character. I visited three national parks in India (Bandhavgarh, Kanha, and Panna), and was rewared with a rare close-up sighting of a large roaring male and many creatures I remembered from the miniatures. 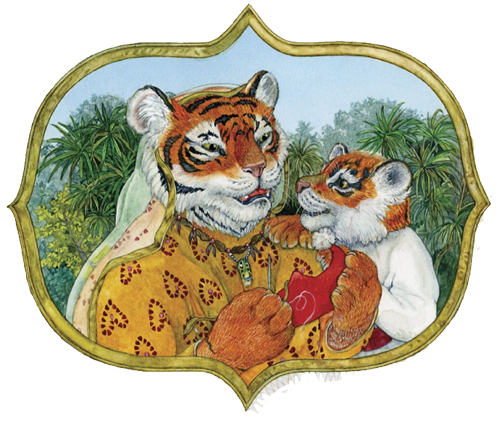 I revisited many more museum galleries once home, and the artowrk inspired an imagined world where tigers wear rubies, and peacocks give blessing to tiger cubs. 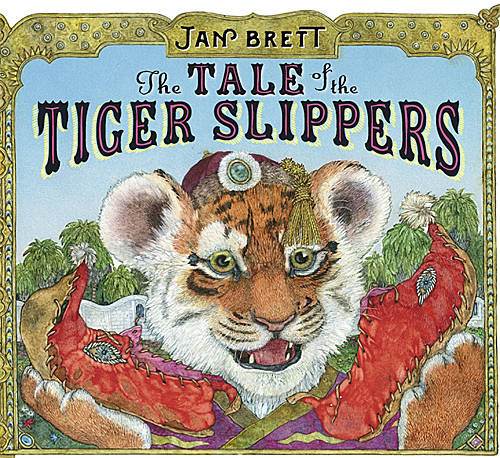 Set in India, this gorgeous reimagining of the classic Middle Eastern folk tale "Abu Kassem's Slippers" features a poor tiger cub who is a very hard worker. His mother weaves him slippers to protect his feet from stones and thorns, and they allowed him to prosper--first making bricks, then building houses, and eventually becoming very wealthy. He continues to wear them until someone questions why such a prominent person would wear such worn shoes. Feeling embarrassed, Tiger tries to get rid of the slippers, but fate keeps bringing them back. Finally, Tiger sends them to his uncle, who weeps with pride when he sees the slippers his sister made and his nephew used to accomplish so much. He sets off right away to visit them, bringing the slippers along. Tiger can't believe the slippers are back again, but his little cub gives him an idea: honor the slippers by building a special place for them, to remind him of how far he's come. Jan Brett's lush, vibrant version of this story will inspire fans of her international retellings to appreciate the hard work that leads to all of their successes.